قبادی, محمد حسین, بابازاده, رضا, اسفندیاری, موسی. (1393). پیش بینی دوام طولانی مدت ماسه سنگ‌های سازند قرمز بالایی در مقابل پدیده ذوب - انجماد و هوازدگی نمک با استفاده از مدل تابع تخریب. نشریه انجمن زمین شناسی مهندسی ایران, 7(شماره 3 و 4), 57-70. محمد حسین قبادی; رضا بابازاده; موسی اسفندیاری. "پیش بینی دوام طولانی مدت ماسه سنگ‌های سازند قرمز بالایی در مقابل پدیده ذوب - انجماد و هوازدگی نمک با استفاده از مدل تابع تخریب". نشریه انجمن زمین شناسی مهندسی ایران, 7, شماره 3 و 4, 1393, 57-70. قبادی, محمد حسین, بابازاده, رضا, اسفندیاری, موسی. (1393). 'پیش بینی دوام طولانی مدت ماسه سنگ‌های سازند قرمز بالایی در مقابل پدیده ذوب - انجماد و هوازدگی نمک با استفاده از مدل تابع تخریب', نشریه انجمن زمین شناسی مهندسی ایران, 7(شماره 3 و 4), pp. 57-70. قبادی, محمد حسین, بابازاده, رضا, اسفندیاری, موسی. پیش بینی دوام طولانی مدت ماسه سنگ‌های سازند قرمز بالایی در مقابل پدیده ذوب - انجماد و هوازدگی نمک با استفاده از مدل تابع تخریب. نشریه انجمن زمین شناسی مهندسی ایران, 1393; 7(شماره 3 و 4): 57-70. سنگ‌هایی که در معرض فرایندهای هوازدگی از قبیل ذوب - انجماد و تبلور نمک قرار می‌گیرند یکپارچگی خود را از دست داده و در طی زمان معینی تخریب می‌شوند. با افزایش تعداد و شدت چرخه‌های هوازدگی میزان این تخریب نیز بیشتر خواهد شد، هر چند که سرعت تخریب برای انواع مختلف سنگ‌ها متفاوت است. در این مطالعه دوام پذیری ماسه سنگ‌های سازند قرمز بالایی (منطقه آوج، جنوب غرب استان قزوین) در مقابل عملکرد چرخه‌های ذوب - انجماد و تبلور نمک، با استفاده از مدل تابع تخریب مورد ارزیابی قرار گرفته است. برای این منظور تعداد 9 نمونه ماسه سنگ (مشخص شده با حروف A، B، C، CG، S، S1، Tr، Min و Sh) از بخش های مختلف سازند قرمز بالایی (در محدوده آوج – آبگرم) جمع‌آوری شده و پس از تعیین خصوصیات فیزیکی، مکانیکی و کانی‌شناسی، در معرض آزمایش‌های ذوب - انجماد و تبلور نمک قرار داده شدند. مدل تابع تخریب این امکان را به ما می‌دهد که بتوانیم پارامترهای معنی‌داری از قبیل ثابت تخریب و نیمه عمر را برای انواع مختلف سنگ‌ها محاسبه کرده و درباره تخریب آنها اظهار نظر کنیم. نتایج به دست آمده از این مدل نشان می‌دهند که پارامترهای نیمه عمر و ثابت تخریب می‌توانند در کارهای مهندسی و با صرف کمترین هزینه و زمان، جهت تعیین دوام سنگ‌ها به کار روند. همچنین این مدل نشان می‌دهد که سرعت تخریب انواع مختلف ماسه سنگ‌ها متفاوت می‌باشند. Rocks subjected to cyclic weathering processes such as freeze – thaw and salt crystallization may lose their integrity and be deteriorated during time. By increasing in cycle numbers and their intensity, the rate of deterioration will be increased; however, this rate is not the same for different rocks. In this study long term durability of upper red formation sandstones against freeze – thaw and salt crystallization were evaluated using decay function model. By using this model it is possible to obtain some meaningful parameters and determine deterioration characteristics of rocks. For this purpose, 9 specimens of sandstones (specified by A, B, C, CG, S, S1, Tr, Min and Sh) were collected from different parts of the studied area, then their physical and mechanical characteristics including unit weight, effective porosity, water absorption, P-wave velocity, Brazilian tensile strength and point load strength were determined. In order to assess the effect of freeze – thaw and salt crystallization on physical and mechanical characteristics of sandstones, 60 cycles of freeze-thaw test and 20 cycles of salt crystallization test were performed. Then their effects on tensile strength and point load strength were recorded in different cycles. Also, decay constant and half – life of these parameters were calculated. In addition, slake durability index test was performed in three different cases such as standard (wet state), freeze – thaw (performing test on samples subjected to freeze – thaw action) and salt crystallization (performing test on samples subjected to salt crystallization action). Obtained slake durability index from different cases were used to estimate decay constant and half-life parameters. Bye using these parameters (tensile strength, point load strength and slake durability index test) and applying decay function model, long term durability of sandstones against freeze – thaw and salt crystallization were evaluated. Results show that decay constant and half – life can be used in engineering practice for determining long term durability without consuming more cost and time. Also this model indicates that the disintegration rate of sandstones is different and the half-lives obtained from three parameters are different for each sandstone. Akin, M., Ozsan, A., 2011. Evaluation of the long-term durability of yellow travertine using accelerated weathering tests. Bulletin Engineering Geology Environmental, 70: 101–114. Altindag, R., Alyildiz, I.S., Onargan, T., 2004. Mechanical properties degradation of ignimbrite subjected to recurrent freeze–thaw cycles. International Journal of Rock Mechanics and Mining Sciences 41: 1023–1028. Angeli, M., Bigas, J.P., Benavente, D., Menendez, B., Hebert, R., David, C., 2007. Salt crystallization in pores: quantiﬁcation and estimation of damage. Environmental Geology, 52:187–19. Binal, A., Kasapoglu, K.E., 2002. Effects of freezing and thawing process on physical and mechanical properties of Selime ignimbrite outcrops in Aksaray–Ihlara valley [in Turkish] Proceeding of 6th Regional. Rock Mechanic Symposium. Konya-Turkey, pp. 189–196. Benavente, D., García, M.A., Fort, R., Ordóñez, S., 2004. Durability estimation of porous building stones from pore structure and strength. Engineering Geology, 74:113–127. Chen, T.C., Yeung, M.R., Mori, N., 2004. Effect of water saturation on deterioration of welded tuff due to freeze–thaw action. Cold Regions Science and Technology 38: 127–136. Tan, X., Chen, W., Tian, H., Cao, J., 2011. Laboratory investigations on the mechanical properties degradation of granite under freeze–thaw cycles. Cold Regions Science and Technology, 68: 130–138. Yavuz, H., Altindag, R., Sarac, S., Ugur, I., Sengun, N., 2006. Estimating the index properties of deteriorated carbonate rocks due to freeze–thaw and thermal shock weathering. 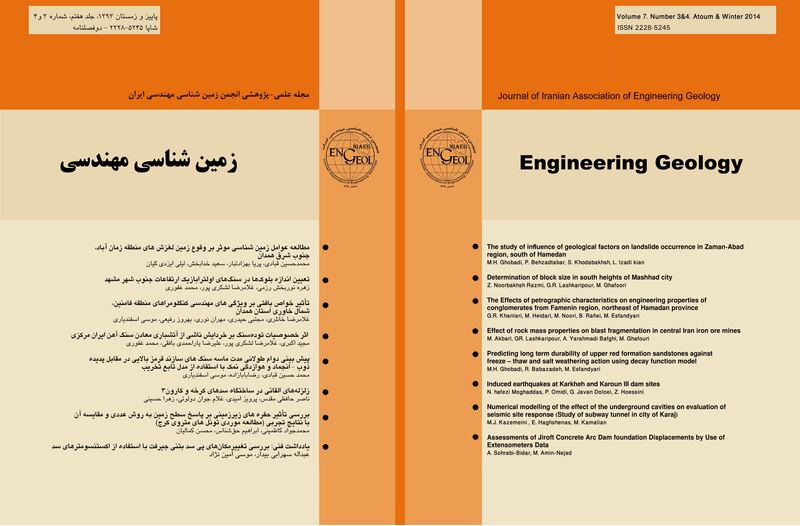 International Journal of Rock Mechanics and Mining Sciences, 43: 767–775.